What he doesn’t count on is meeting Gabriel Carillo. Gabriel is kind, mysterious, and seems to be on his own mission to ensure their paths keep crossing. But Tate’s hiding an awfully big secret—one he’s certain even Gabriel can’t forgive. Does a man’s past have to determine his future? In the middle of cities filled with history, Tate is going to find out. Hello! 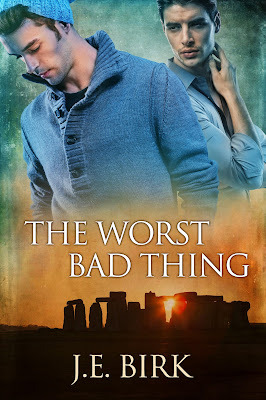 I’m J.E Birk, and I’m excited to be here today talking about my new novella, The Worst Bad Thing. I’ll admit the truth up front: I love a good flashback. As storytelling devices go, it’s easily one of my favorites. It gives readers hints into a character’s storyline they wouldn’t normally be privy to, and it gives writers a chance to explore multiple facets of a character without having to “tell” their background. Yeah. I may love flashbacks just a little too much. Anyhoo, I went a wee bit crazy with the flashbacks in The Worst Bad Thing. This story was born out of a horrible tragedy that happened within my community. I didn’t know what to do with the multitude of emotions I was feeling about that tragedy, so I wrote through them. And as I created the character of Tate to help me work through schtuff, I couldn’t help but fill his story with flashbacks. Tate’s story is very much about two parts of his life: the present, where he is just trying to get by, and the days surrounding the greatest tragedy of his life, which have come to define him. With each chapter, the reader flashes back to that tragedy with Tate before joining him again in the present. Below I’ll share Tate’s first flashback from The Worst Bad Thing with you. Thanks so much for joining me on this blog tour. I hope you enjoy Tate’s exploration of his past and present. I’d become numb to that sort of sentiment. Everything happens fast. Life happens fast, whether we want to believe that or not. But that moment did happen faster. I know that because I’ve lived a million slow moments ever since. I can see it now—sometimes vividly—in my mind. The container I grabbed, laughing stupidly, telling my students that they’d never forget what they were about to see. If only I had known how true that statement was. I opened the container and poured. And it all happened so fast. The orange and red that flashed, and the screaming. It hangs in my ears sometimes, a persistent shriek that can’t be silenced by clicking a switch or changing a battery. The flash of flame was there and gone, so quickly that I sometimes still wonder if we all just imagined it. In the seconds after I poured out the chemical, after the flash and the cries, it was almost as though I left my body for a few seconds and looked out on the chaos that had become my classroom. The version of me standing below just stared, motionless, while teenagers rushed around yelling. They grabbed my sleeves and tugged at them wildly. From above, I watched as Des, the physics teacher, rushed in from next door. Her face crumbled, and I heard her call out for 911 as she grabbed the fire blanket. I watched as she turned to me. Her words will live with me for at least as long as the screaming. They will clang together in my ears for years and years to come. I worry sometimes that they will eventually become such a part of my everyday existence that I will no longer hear them at all. J.E. Birk has been telling stories since she could talk and writing them since she was introduced to the alphabet. She hails from Colorado, where you can usually find her skiing, training for a 5K she won’t end up running, or watching grown men run into each other on football fields and in hockey rinks. You can follow her ramblings on Twitter by looking for @jebirkwrites. She’s also been known to ramble on Facebook as J Elisabeth Birk. Thank you so very much for having me on your blog!